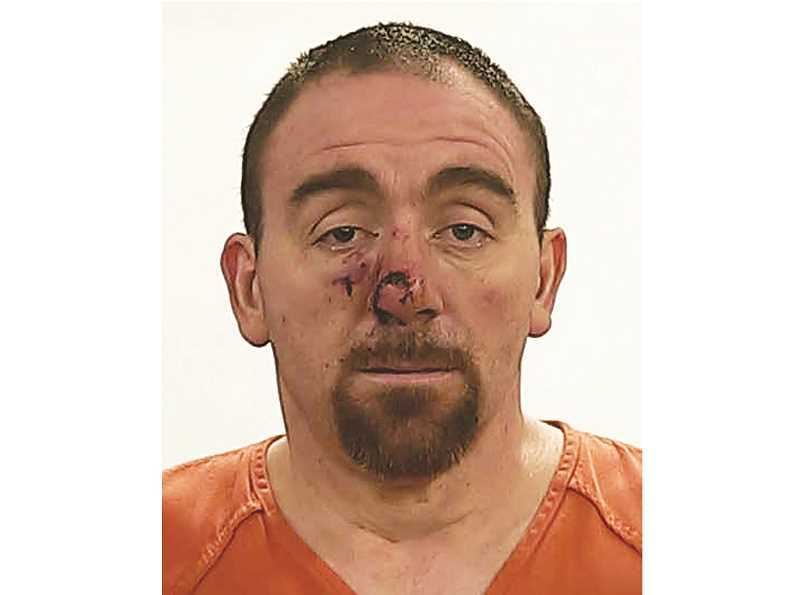 As part of a negotiated plea, a Madras man accused of stabbing his domestic partner was instead sentenced for first-degree burglary. Robert Lee Stafford, 50, pleaded no contest to first-degree burglary, a Class A felony, which occurred on Dec. 24, 2018. Circuit Court Judge Dan Ahern sentenced Stafford to five years in the custody of the Oregon Department of Corrections, and three years of supervised probation. Charges of attempting to commit murder and second-degree assault were dismissed. The incident occurred around 3:44 p.m. on Christmas Eve, when Madras police officer Josh Roth received a report of "a stabbing in progress" at a residence on Southwest J Street. When Roth arrived at the residence, he saw a naked man — later determined to be Stafford — breaking through a sliding glass door at the residence, and grabbing a woman. As Roth ran toward the house, Stafford was holding the woman, his domestic partner, who had been stabbed numerous times and was screaming. Stafford, who had a knife in his hand, did not respond to commands shouted by Roth, who then deployed a stun gun on the man. When the man continued to hold the woman and a large kitchen knife, Roth was able to pull the woman away. Roth reported in the arrest affidavit, "I unholstered my department-issued duty weapon and delivered one focused blow with the barrel of my duty weapon to Mr. Stafford Jr.'s facial area." Stafford fell on his back and dropped the knife, but refused to comply with Roth's commands, repeatedly attempting to get up, and getting pulsed with the Taser. As Stafford was trying to grab and remove the Taser wires, a deputy from the Jefferson County Sheriff's Office arrived and assisted in getting handcuffs on Stafford. The female victim, who had at least four stab wounds, along with lacerations to her hands and fingers, was transported to St. Charles Madras by Jefferson County Emergency Medical Services. Stafford was also transported to the hospital, but did not have any similar laceration wounds. At that residence, Roth spoke with the older couple, who had tried to assist the woman as she fled a nearby house. The male homeowner said that he was outside, turning on his Christmas lights, when he saw the female neighbor running toward him and screaming. He then saw Stafford running toward them with a large knife and ran with the woman into his house, entering through the sliding door. The neighbor's wife said that the assailant, who was known to her, grabbed a hammer and started breaking the sliding glass door, saying that he was going to kill woman he had been chasing. Inside the broken glass door, Roth reported that there was a large amount of blood on the floor. The two told Roth that Stafford was visiting his mother, who lived in a residence about 50 yards away. When Roth checked out that residence, no one answered the door, which was ajar, or responded to his calls. He entered the house to check on the welfare of Stafford's mother, and found her asleep in her bedroom, connected to an oxygen tank, and unaware of the commotion. Roth also "observed a large amount of blood on the kitchen floor," as well as several kitchen knives. The victim of the stabbing told a police detective that she had been in an "on again, off again" relationship with Stafford for about 13 years. She told police that Stafford had used cocaine, and was under the influence of illegal narcotics during the assault. At sentencing, Jefferson County District Attorney Steve Leriche said that Stafford's partner was "sympathetic and forgiving," and "wants to continue the relationship." "It was fueled largely by drugs — perhaps cocaine," he said, adding that the homeowners were very scared by the incident. Attorney Jason Munn, who represented Stafford, said that Stafford hoped to be able to serve his time at Deer Ridge Correctional Institution, to remain near his mother, and wanted to receive drug treatment. Ahern agreed to drop the attempted murder and second-degree assault charges, which would have required a mandatory sentence of 70-90 months in prison. "It's clear, based on your bizarre behavior, that controlled substances paid a part," said Ahern, noting, "You're going to pay a heavy price for it." Ahern advised Stafford to "seek whatever help you can get." Stafford will not be eligible for sentence reductions for "good time," and will also be responsible for restitution to the victim.